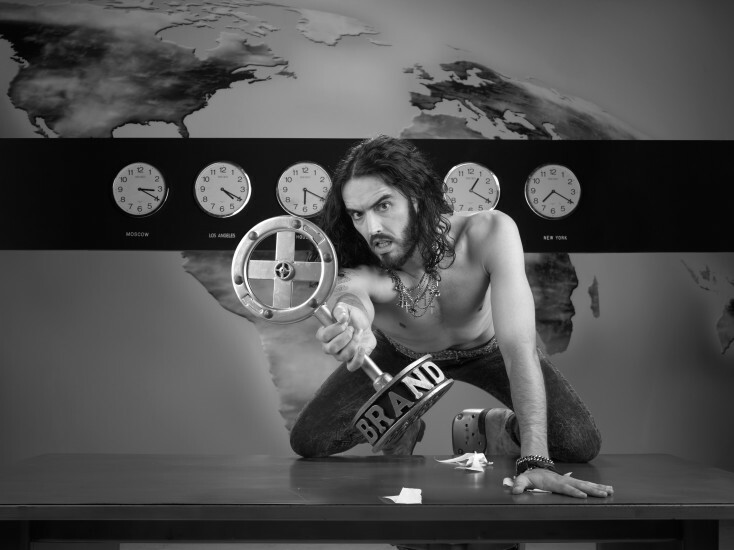 Russell Brand hosts his new talks show "Brand X With Russell Brand." ©FX. Controversial and outspoken, Brand seems like the perfect host for a late night talk show. That is, if the audience can understand his unique stream-of-consciousness discourse. His show, titled simply “Brand X,” premieres June 28 on the cable network FX at 11 p.m. (ET/PT). The irreverent comedian recently sat down to discuss his new show and what viewers can expect from this newest British invasion. Front Row Features: How much of your show is going to be about you and your personal experiences in Hollywood? Russell Brand: I think there will be inevitable biographical elements, because you can’t speak from anyone’s perspective but your own. Unless I was to bizarrely adapt some sort of avatar. It’s like if I were to speak from the perspective of, I don’t know, Angelica Huston, people would think I lack the proper authority. Imagine if I said, “It was a tumultuous relationship with Jack (Nicholson), and indeed my father (John Huston). Alpha males through my life have caused me problems.” People would go, “F*** him. He’s not qualified.” So I will speak in my own perspective. I’m in this extraordinary country of yours. I’m not from here, am I? I’m English. So it is the perspective of an alien trying to understand this peculiar time, this peculiar country. Front Row Features: You’re known for speaking your mind. Will you be able to do that on the show? Brand: What other way is there to speak? This country is founded, nominally, on the notion of freedom of speech. So I will continue to speak freely. There is, fortunately, no impediment to absolute freedom of speech. This is one of the cornerstones of your wonderful nation. Brand: I can’t objectively compare myself to another human being. I don’t know what it’s like to be somebody else. All I know is that my goal in standup comedy is to acknowledge that within each of us is a divine and beautiful light through truth and authenticity. And being funny, we can connect to this light and change, I believe, the tenure and frequency of our consciousness. That may seem like a noble objective on FX, but we’ll give it a whirl. Front Row Features: Is your show going to be political? What do you think of GOP presidential candidate Mitt Romney? Brand: This is what I know about Mitt Romney. I know that he is so rich that even the One Percent to him would seem like peasants. Other billionaires must sicken him with their depravity. Other billionaires, to him, would seem like Dickensian street urchins eating gruel with fingerless gloves. And he’s a Mormon, isn’t he? I got nothing against religions. I like metaphorical systems for understanding mortality. I think it’s a good idea. Death is confusing. It’s good to have some infrastructure. Front Row Features: Will you have to bone up on American politics? Brand: We know in our hearts that it’s a spectacle, that it’s meaningless who is the president, don’t we? We know that it’s redundant what they say to us. We know whose interests are represented by politics, don’t we? We don’t believe that Mitt Romney (or) Barack Obama would make any difference at all, whoever is in charge of us, until there is a fundamental spiritual revolution. Front Row Features: Do you feel you can shine a light on us from a different perspective? Brand: I’m not here to shine a light on America from a position of judgment. This country has been incredibly generous and kind to me. And in many senses I think, culturally, it’s still the greatest country in the world. So it’s not a finger-pointing exercise. Many of the aspects of American culture that come under great criticism from abroad are certainly not a peninsula that a British person could arrogantly judge from, given that we did our fair share of colonialism, didn’t we? We stuck a few flags in places, subjugated people on the basis of their religion, skin color and whatnot. Front Row Features: So are you taking an apolitical stance then? Brand: Ultimately, there are many more qualities that unify us as a population. In fact, the only legitimate distinction in global politics and society is rich and poor. They’re the only things that we should be concerned about. Are you rich or poor? And if you’re poor, you shouldn’t be f***ing around worrying about what other poor people are doing. You should be unifying. Front Row Features: What do you like about America? Brand: I think it’s done really wonderful things with the English language. Front Row Features: Do you see yourself as a British Don Rickles? Brand: I don’t see myself as Don Rickles, who is obviously a great master of the craft of standup comedy. I don’t see myself, or my role as a malevolent jester, attacking people who are already being attacked. All I want is for people to feel better than they do now. All I want is to make people laugh and to make people happy. As long as I stay in alignment with that, then I’m served by great forces. Front Row Features: Is the FX show going to be you all the time, or will you be having guest stars? Brand: You say that as if that would be a bad thing. “Oh, it’s always him.” You could just watch another channel. Brand: It’s a very free-flowing show, because this is a very modern time. You know how (FX’s comedy show) “Louie” is to the convention of sitcom? I would like this to be news and topical comedy— very deconstructive, brilliantly put-together, shot on close-circuit cameras and stripped of all nonsense and subterfuge. (There will be) no, “Coming up after the break…” None of that rubbish; just truth, beauty and humor.